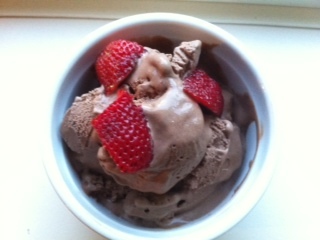 I made this amazing chocolate ice cream recipe today, it was so quick and easy too. The recipe comes from The Spunky Coconut Dairy-Free Ice Cream recipe book that I purchased from https://www.createspace.com/3867959. The author is Kelly V. Brozyna and I haven’t tried one of her recipes yet that hasn’t been satisfying. This mom of three is brilliant with her creations of healthy recipes. The ingredients are relatively easy to find. The only one I had to purchase that is not usually a staple in my pantry is guar gum. It is a thickening agent and if you want your ice cream less thick, you can leave it out. I bought mine at a health food store. It may have even been found in the organic section of the grocery store. Freeze this mixture in a container for an hour or until cold. Add to the ice cream maker until your desired texture is reached. We put ours in for about 1/2 hour and then it was just right to serve in a cone.